In the first and third week of my tour, I had mid-week fixture lists to enjoy, giving me a choice of fixtures, even if in many cases they were only second division matches in the countrys concerned. The middle week was different, though  the appearance of a bank holiday on the Monday concentrated the fixtures onto that date. This left me with the choice of either missing out on my hope to see a match on every day for the validity of my 22 day rail pass, (which would have allowed me to head further afield, for a single game), or to pick up those matches I could find from the re-arrangements after postponements. For example, if I had chosen to miss Tuesday and Thursday, my Wednesday match could have been in Belgrade. Having rejected this plan, I dropped my levels, seeing a match in the Swiss 2.Liga Inter-regional (4th level) on the Tuesday, and a Landesliga (5th level) game in Germany on the Wednesday. Now the fifth level of the English pyramid is the Football Conference  with highly developed minimum ground standards and average crowds well above the thousand mark. But England is not like the rest of Europe (or the world). We have more professional clubs, and more clubs with regular crowds over 1000 than anywhere else. Only the Italians come close. Germany has two regional divisions at its third level, nine oberliga at level 4, and no less than 27 (called either Verbandsliga or Landesliga) at level 5. This means that far from being an equivalent to the Conference, the teams are more in line with lower division Southern League, or even Hellenic League football. My fixture was in a place called Grebenstein, which research had shown to be deep in the very centre of Germany. In fact, quite easy to get to from Basel  the fast and comfortale ICE train speeds me as far as Kassel, and then a local regional tram deals with the last 18 km. The regional tram was a new one on me  it turned out to work as a normal tram around the streets of Kassel, and then transfer to the railway tracks for the longer out of town journeys. I tried to walk around the town in Kassel for a while before transferring out  this proved impossible after a week or more of good weather, the temperatures in this part of Germany had risen to 32°C in the middle of the afternoon. So melting after just a short walk, I bought an ice-cream and found the tram. As it was, I think I should have made the transfer earlier, as Grebenstein did not turn out to be a dead residential suburb, but a small village full of half-timbered houses; more rewarding to the eye than Kassels modern but dull centre. As is often the case, the railway station and football ground are both on the edges of the village  one at each end, but this is a small place, fifteen minutes comfortably takes me from one to the other. The Sauertalstadion has been built (or more accurately dug) from a hillside on the edge of the town. It is a standard bowl shaped ground, but with grassed sides too steep to be used as terraces. A path, about 2 metres wide has been cut all around the ground, at a level height apart from at the bottom end of the ground, where it follows the natural slope down to pitch level. The entrance level is a little higher again, and at this point too there has been levelling out to provide the essential buildings, dressing rooms and bar. A flight of steps take the players and officials down to the pitch. On a warm spring evening, with the shadows lengthening over the pitch, there can be few more pleasant locations to sit, enjoy a beer and watch a game. The game itself is nothing special, both teams are away from the action zones of the league table. For the record, the match in the Landesliga Hessen Nord, and the away team VfL Eiterfeld beat the home, TuSpo Grebenstein by two goals to nil. After the game, the regional tram takes me back into Kassel, another local train to Gottingen, and then an overnight one through to Vienna. Sometime in the middle of the night, Paul and Kevin who I had last seen a week ago in Switzerland (Gossau) boarded the train on their travels away from an East German game. We only meet as we get off the train, and transfer to the local trains taking us south of the Austrian capital to Mattersburg. If we had wanted to go to the main football stadium in Mattersburg, then none would be easier to find. Mattersburg has two railway stations, Mattersburg Nord and Mattersburg, and the ground is settled below the viaduct that holds the tracks between the two stations. Of course, life is never quite this simple, but I will get to that later. In fact, the first priority on arriving at the town is to find somewhere to stay. Arriving at the station around 10 in the morning without a plan  or even a map to find the town. Finding the town is the easy bit  one picks on the only landmark (except the football ground floodlights) and heads in the direction of the church spire. To find out if there is a hotel once we arrive is more difficult. With nothing immediately visible and no signs, Kevin takes the novel step of asking a local. He gets some indistinct directions, and we in fact have to ask again before we found the towns only hotel. As it happened, the Florianihof was a pleasant and reasonable hotel, at a reasonable rate  and providing one service one does not always find even in the best quality of hotels. As I mentioned, life is never too simple  Mattersburg have reached the top division of Austrian football, and their league season was over before we arrived in the town. Anyway, I had been to the stadium to see them lose 2-1 to Austria Wien in 2005. 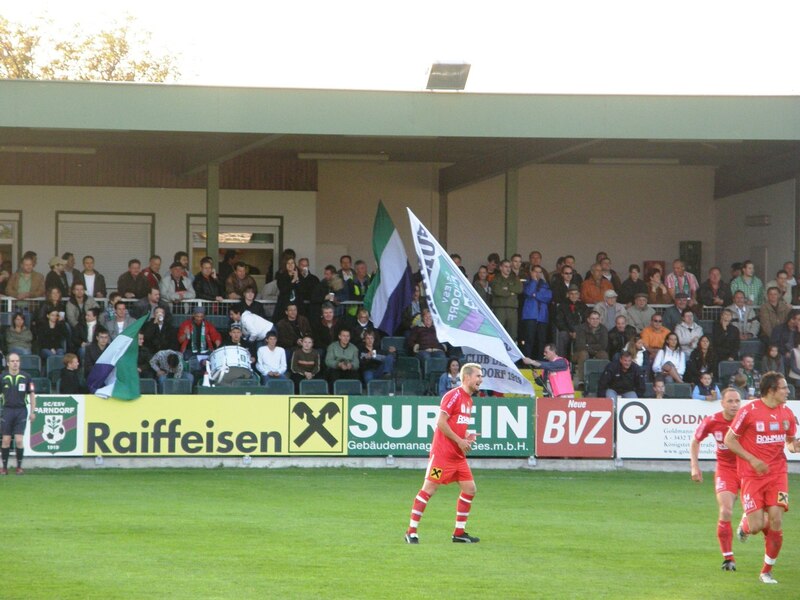 The plan on this occasion was to see Mattersburg Amateur  the reserve team  playing in the Regionalliga West. The match was not at Mattersburg, but in a village called Hirm, about 8km away. We had confirmed there was a bus to the village although it would have meant arriving two hours before kick-off, but we also knew there was no bus back. So we wandered off to the stadium, to find the football club offices and see if they could help out three stray Englishmen. Not surprisingly, there was no transport laid on for supporters, but they did say they would try and find someone to help us. Then the lady we were talking to had a brainwave. Are you staying at the Florianihof, she asked? Yes, we replied. Well, then  ask the manager of the hotel, Herr Bandat, as he is a regular supporter and goes to most of the matches. And so, we returned to the hotel, ready for our lunch, (the Florianihof puts on a very good value buffet lunch), and asked to speak to the manager. Sure enough he was intending to see the game and could give us a lift there. And he would talk to some of his friends and find us a lift back as well. As it happened, he made the return journey with us himself, going out of his way as he could not find anyone else to make the journey. This is certainly service that you tend not to get with the best five star hotel. Demonstrating an independent spirit, and more energy than us oldies, Paul and myself, Kevin walked out to Hirm, while I was more than happy to accept the lift. With around 300 people watching the match, the Alfred Wiesinger Sportanlage in Hirm was an ideal setting, whereas the big stadium in Mattersburg would have dwarfed the crowd. There is a covered stand along most of one long side, and flat standing in front of the clubhouse behind one goal. On the other two sides, there is no room for spectator accommodation. The visiting team was St. Polten, a team I had seen play at home in the top division of Austrian football nearly 20 years before. They have had a number of years outside the professional levels having fallen bankrupt, but are now on their way back, and led the Regionalliga Ost going into the match. Although Mattersburg scored both first and last in the game, for most of the 90 minutes, St. Polten were just too strong for them. The final score was 4-2 in favour of the visitors. The next day, Paul and Kevin were up early, and had left the hotel before I started on breakfast  heading for somewhere at the far end of Austria again, (I think). We arranged to meet again on Sunday morning in Budapest! I had elected to make the short journey to Vienna and to see another team that I had seen grace the top division (away) near enough 20 years ago. This club was First Vienna  although the name (in English, never German) could just as easily be First Austria as they claim to be the countrys oldest club. As I left the hotel, I met with Herr Bandat again, and he presented me with a bottle of local wine as a memento of my visit. Thanks again sir – you are a gentleman and a football fan! In 1990, I had seen First play away in a Vienna derby at Rapid Wien. Rapid and Austria Wien have been the top clubs in the capital and country ever since. First have dropped two divisions, so this was again football in the Regionalliga Ost. Rapids amateur side also play in this division, and now hire the ground from First. When both teams are scheduled to play at home, they play a double header with Rapid Amateur starting at 5.30, First Vienna two hours later. A 9 ticket allows one to see two matches, while the small A5 programme covers Firsts game only. The ground at Hohe Warte must be almost as old as the club. Out in a northern suburb of the city, one side of the ground is a vast hillside, now almost completely overgrown, but with just enough sign to show that once it was completely covered with terracing. The nearest equivalent in England would have been the valley, but Hohe Warte is taller. This one side of the ground must have once been able to hold at least 20,000 people. Nowadays, only a small part of the lower terrace is being used, and rather than renovate the old terrace, a new terrace has been build using steel scaffolding and aluminium coverings. Opposite the large slope is a quite modern stand, while the curves behind each goal were hardly used. In both matches, the Vienna based side were among those in the chasing pack behind St. Polten, although they did not harbour any hope of promotion this season. The visitors Schwechat in the first game, and Zwettl afterwards were both near the bottom of the table. In fact if both were to win their matches, then Mattersburg would be dumped into the relegation zone. I had discussed this the night before at the Mattersburg match. Having not been in the top division for long, they are only just developing their Amateur side. It was a very young team, more youth then reserve, but they were desperate to keep at this level, where they think there is more chance of the players developing that are suitable for the first team. As it happened both matches were comfortable 2-0 home wins, leaving both the top and bottom ends of the table unchanged. Both the Vienna sides played some good football at times, but neither could manage to dominate the game in the way that St. Polten had the night before. Stan turned up, returning from London, midway through the first game. It had always been his intention to see the second game (i.e the First game) only. Afterwards Stan disappeared in search of an overnight train, while I headed to a hotel, which was to allow me reasonable access to Hungary the next day. Please excuse the shortage of photos. They take time to download, but I will try to add some next week. Sunday was again heavy on the mileage, even if I had dealt with a lot of the problem Saturday evening. I stayed overnight in Dresden, which required five hours on the rails after the match at Brno. The only reason for this was that it seemed to be the most convenient stopover point. In the old East Germany, the sun sets early in winter, and this leads to 1.30 kick offs soon before and after the winter break. In May, of course, there is far more latitude to choose the kick off time, but some teams including Hallescher FC, choose to stick to the early kick off. I arrange to arrive by midday, to give myself a short amount of time to see the city before the game. I know I have a choice of trains later, (Frankfurt having been chosen as the next break point), and so can return to the centre. Halle is a seat of learning, and the birthplace of Handel. Its centre has been preserved as historic monuments, but I have just arrived from Brno, and by comparison, it is the same but smaller. One of the major monuments is cloaked for repairs, and a fair is set up crowding the central square. Walking just off the main square past the cathedral is a small square that was the setting for one of the first anti-communist uprisings of the 1950s. It seems a pity to me that this is not better commemorated. The tourist office seemed surprised when I asked about the football stadium; they found me directions to it, although it is not in the area covered by the tourist maps. This is a pity, because in itself it is a gem  a splendid example of either fascist or communist architecture, (in stadium terms, they tend to be similar), wrapped up in red stone. I suspect it was build after the communists came to the area  the six statues outside the main gateway are of workers and certainly appear to be communist style, (although one, in what must be a nod to Halles status, appeared to be an academic). Sadly, the ticket windows cut into the old walls are no longer in use, and the same steel cages that protect almost every ground in Germany have been build around the entrances. Inside, it is a typical bowl. The steps are not as steep as Brno, and the whole place is on a smaller scale, and there are no shortages of recently added fencing. Plastic seats have only been added to a central section on one side, and the main area, including the covered zones. The cover anyway also appears to have been a later addition. Unusually, this is on the North side of the ground, and as a compensation, and extra shade has been hung from the front edge, to keep at least some of the best seats in the shade. The game was in one of the nine Oberliga that currently make up the fourth level of German football. With the new national third division being formed next season, and only three regional leagues at the new level 4, the most important thing for the Oberliga teams is to try and see if they can qualify for the new leagues. Hallescher lead their division (Oberliga Nord Ost, Staffel Sud  or North East League, Southern Group  which reminds me of some of the English non-League divisions). The visitors for day, Germania Helberstadt are just off the pace, but would certainly come back into the competition if they could win this game. As it is, Hallescher take the lead in only the second minute, but then hang back and try to absorb pressure. This is not a successful tactic, and Halberstatdt equalise half way through the half, and continue to attack to the break. In the second half, we again see the home side take an early lead, but this time they do not give away chances so easily. Still they appear incabale of adding to the lead, even when a long distance shot is handled on the line by the Halberstadt captain. The resultant penalty was saved, but the red card given to the visiting player was probably the deciding factor in keeping the scores unchanged (at 2-1) to the end. From Halle, it was on to Basel, a Swiss city with borders to Germany and France  a cathedral overlooking the Rhine, and a completely different definition to me of reasonably priced hotel. I had to pick on a cheap hotel instead  about £60 per night. I think Im glad now that Ive not got Euro 2008 tickets. Seriously, what I got for my money was quite reasonable, and the local authorities throw in free local transport for anyone who books a hotel, (they also charge a local tourist tax). It did not take me long to get onto the local transport. In all, I used two trams and a trolleybus to get from the hotel to the Rankhof stadion. A journey of less than 15 minutes, including a full minute waiting for a connection! The Rankhof may be the ultimate in municipal stadiums. There has to be some beauty in the sterile symmetry of the concrete blocks that make up the stadium, a symmetry that is broken as soon as the first member of the crowd enters. Naturally, in a stadium that worships the right angle, there are no curves anywhere, and all four sides sit square to the pitch. On three sides, we have around seven steps of concrete terracing made up from large concrete blocks. Smaller blocks provide steps. The final side has a stand built well above ground level. In fact the path at the front of stand sits level with the highest step on the other three sides. This allows a bridges to connect between them, although each had a gate that stayed locked shut. The stand was similar is scale to the terraces, while the space underneath provides places where food and drink can be provided. The dressing rooms themselves are a level underground. On a hot, sunny day, the area under the stands provides the only shade from the sun, for those who have not bought seat tickets, and there was a brisk sale of Bratwurst, beer and even ice-cream. Onto the roof of the stand, naturally a cantilever, efficiently styled in concrete, the single word RANKHOF is displayed in large red letters, reminiscent of the almost identical signage used airside, at so many international airports. Entrance, to spoil the symmetry of the stadium cost 15 CHF (about £7.50), an A4 sized programme was free. One felt that scoring goals would be a travesty, an imperfection, and for a long time it appeared that the teams felt the same way, meandering through 85 minutes that brought new meaning to meaningless. But then, in a shock move the home side Concordia Basel actually scored a goal. This certainly took the visitors, Shaffhausen by surprise and the only response they could think of was to allow Concordia a second goal, just as the game entered injury time. A match that kicks off at 4 p.m. on a Swiss Bank Holiday does not have to be the end of my day though. I was not quite so lucky with the trolleybus and tram connection  I only rode two this time, but spent longer waiting than riding, still this was comfortably early enough to catch my train, and with two further changes arrive in Wohlen (on time, of course) at 19.42. The trouble with arriving in a quite strange town, just 18 minutes before kick off, is that one does not know exactly which way to turn, so one has to turn to a taxi driver. I spent about 2 minutes in the taxi, and he built up a metered fee of 15 CHF (£7.50). I then had to pay another 18 CHF to get into the game. Programmes were free, but there were none left! (Fortunately, when I started to ask around, I managed to find one). I had been to Wohlen before, and they then played on a pitch on the edge of town, next to farmers fields and with a small wooden stand. They now play on a pitch on the edge of town, next to farmers fields, but with a large concrete stand. I had been told it was a completely new ground, but to be honest, I could easily have been made to believe it was the same one with a rebuilt stand. When I got back to the station later, I did manage to locate the two on the map there, not much over a kilometre apart. Incidentally, the walk back took not much over 15 minutes! Apart from the modern stand, which is the main feature of the new ground, Niedermatte at Wohlen has one step of terracing around most of the ground. Typically, there are food and drink vendors on both sides of the ground, but it is otherwise generally featureless. The away team was Gossau, who I had seen at home the previous week. Having seen them play defensive on their own pitch, I was surprised to see them play a more open game here, while despite their higher league position, Wohlen looked nervous and unconvincing, they kept their own defensive positions up even though they were a goal down midway through the first half. This was an own goal, and may be the only way that Gossau could hit the target, but over the period of ninety minutes they were the better side, and should have achieved a bigger win. Speaking to a journalist who was covering Gossau, I was told this was typical of the team, who had picked up more points on their travels than at home. My third match on this trip to Switzerland, (which meant for the first time on tour, I stayed in a hotel two nights in a row  pity it was the most expensive I had stopped at) was for a match in what is called 2. Liga Inter-regional. The structure of football in Switzerland has to some extent remained unchanged for quite some time. Ever since I have started watching Swiss football, the professional league has been divided into two divisions, if the numbers in each have changed. When I started watching there were 24 professional teams, while this season there are 28 in divisions of 10 and 18. Next season, the lower division (Challenge league) will lose two teams in number, and the professional ranks will be 26. Within this, there is a big difference in class and scale between the two divisions. The next league down, which is certainly semi-professional consists of three regional divisions, and is called 1. Liga (first league). Some of the professionals run U-21/reserve teams at this and lower levels. Despite three divisions at this level, play-offs are always required, as I have never known more than two places to be available. Most of the grounds are relatively basic by English non-league standards, and it is only the big end of season matches that can draw big crowds, around two to three hundred being typical the rest of the time. The next level down has five divisions, and is known as second league inter-regional. Clearly sometime in the past, this has been interposed between the 1. Liga and the leagues run by the regional associations, as all of these have 2. Liga as their top level. So a 2. Liga Inter-Regional game, between Belfaux, a small village outside Fribourg, and Breitenrain, a suburb of Bern. I have chosen the match because it is the only fixture I could find  this mid-week being used only the re-arrangement of a small number of postponed games. It is not a bad choice though  as Breitenrain come into the match just two points behind the league leaders, so a win would take them to the top. Belfaux is a small village, centered on an improbably large church. It has two railway stations, CFF on the main Swiss Railways line, and Village on a small independent line. The CFF station, at 15 minutes is the longer walk from the ground, which is reached by simply dropping down the hill until the village stops. A small lane takes you to the sports fields  strangely on one side of the lane is the main pitch, reached by a bridge over a small river, and guarded by ticket sellers. (The match programme, which is free, was originally produced for the postponed game, but comes with a sheet of paper giving updated league tables). On the other side of the lane is the club house, bar and another floodlit pitch. It is clear why this is not the pitch of preference  it is very much undersize, but I wonder at what level in England a club would be allowed to operate with players crossing the road to the pitch? Not surprisingly, the ground consists of nothing more than a pitch with a rail around it. Hard standing is limited to an area near the entrance. The ground is not even enclosed. There is another small road bridging the river by one goal, going up to a farm, and there is nothing to stop people parking here, and entering the ground on this side. With Breitenrain needing to win the game to go top of the league, I was expecting them to provide a formation to attack the home side and put them under pressure from the start. On the contrary, it was a safety first performance, abetted by cynical diving, players feigning injury and general poor sportsmanship. Whereas I can understand in the professional game, the pressure for results means that this sort of play can be almost necessary, but this is an amateur game  the objective is more for the enjoyment of the players than the spectators, and I cannot believe that players enjoy being harsh and cynical in their play. Anyway, the team clearly had the ability to win the game by fair means, but ended up doing so in a way that left a foul taste in the mouth and which could win no friends. In the end, the Bern team won 1-0 with a long distance second half shot that took a deflection. They celebrated the win as if they had win the European Champions League. I did not feel the desire to applaud, but instead returned to the trains, where for a while I had the chance to speak to a Swiss based groundhopper, who seemed to feel the same about the game  except that he thought this was par for the course in the country. For the fourth match of my tour, on the Friday, it is a return to Austria, with a simple but quite lengthy journey from St. Gallen. Paul and Kevin, who had been with me at Gossau made a shorter trip along the same line, while the Wolves fans, Peter and Stan were coming up to meet them with a complex overnight journey from the south of Switzerland. All four had a further overnight to come, to get them into the Czech Republic, whereas I choose my matches to give myself more day time travelling, and the luxury of a bed for the night. There is another reason why the others shunned my choice of match, despite the fact that the home side are liable to be promoted to the Austrian League next season. This is the opposition, Austria Kärnten Amatuer are the reserve team of a team in the Austrian top division, and some groundhoppers will not watch reserve football under any circumstances. The trouble one finds with reserve football is that a team may suddenly become weaker, (or on occasion stronger) due to the demands of the first team. I certainly accept that reserve teams can be an unbalancing factor on a league, with uneven results if they can field a much stronger squad one week than the next  and I would prefer it if the leagues themselves stopped them from competing, creating separate reserve competitions instead. But once a team is in a league, I will not deny myself a match just because they are the away team. I even allow myself an occasional match where a reserve side is at home, although I have a strict rule that a new ground cannot be ticked for reserve team football, unless it does not share with the first team (or exceptionally, when watching a double header, with the first team game to follow immediately after the reserve match). Vöcklabruck is a small town between Salzburg and Linz, it is simple enough to get there, as it is on the main line through north Austria, although not all trains stop there. After arriving at the station, I walked into the town, which rather unsurprisingly was reached by crossing a bridge over the river Vöckla! The town is pleasant but small with the central area running between two entrance towers. These would date back to the town being a market centre in the 17th and 18th centuries. Now it is the sort of place where tourists might stop for an hour or two, and so it has plenty of bars and restaurants in the centre. I took the time to eat there after the match. The football ground is outside the centre and the opposite end of town to the station, but this is not a problem  the distance could comfortably walked in 20 minutes. It is a multi-sports stadium belonging to the municipality. It has a running track, with a pathway all the way around, always raised somewhere above ground level. This is relatively narrow behind the southern goal and on the Eastern side, (where a sports hall would prevent any further development). The northern side has a series of club buildings, with fried sausages, coffee and sandwiches, and course, Beer. The main development is a stand on the West side. While several people watch the game from the areas where the bars are, there is another beer seller in the stand for those who prefer to sit down, and find it too far to walk back. The official crowd figure given for the match is 500  which fills most of the seats. The club sits proudly at the head of the Regionalliga Mitte table, and has been given the licence required to take its place in the professional ranks next season. A small group of younger fans were creating a little noise and showing their banners. One of which had a stylised footballer made out of a dollar sign, within the traditional road sign, a circle with a single line through it, (international for not allowed, or at least not wanted). I asked them about this, and they explained they were protesting the damage caused by the money coming into football. The example given was Red Bull Salzburg, where the owner of Red Bull  one of Austrias richest men is putting in far more than the average sponsorship. But so far, this effort has failed to give the team a competitive advantage, with the 2007 title, being the only one in three years of sponsorship so far. Far more worrying is the name changes that can lead to the fan unsure of who to support. It has long been accepted that sponsors names are attached within club names, Vöcklabruck are actually 1 FC RFE Vöcklabruck, but more recently the sponsors have managed to obliterate the town name. At Parndorf, the team from Schwanenstadt was officially known as SCS Bet-at-home.com, The biggest of all these was the small township of Pasching, just outside Linz. In a period of about six years, they went from the fifth level to a place in Europe, but then lost their name and became Superfund FC. When the controversial Jorg Haider, regional president in Kärnten, wanted a top division club to fill the newly rebuilt Wörtherseestadion (Euro 2008 venue), he did not go back to Kärnten FC, who had been pushed out of the stadion while it was being rebuilt, and had been relegated in the meantime. So instead he looked to the top league clubs. After making overtures to the Graz club GAK, (finding the debts there to be too big  the club was wound up and took their reserve teams place in the regionalliga), he came to agreement with Superfund, and moved the whole club some 200 km south. I imagine this came as some shock to the authorities in Pasching, who spent a lot to build up the stadium, only to find the club back where it started the fifth level (Pasching also repaced theie own reserve side). The new club for Kärnten are now known as Austria Kärnten. 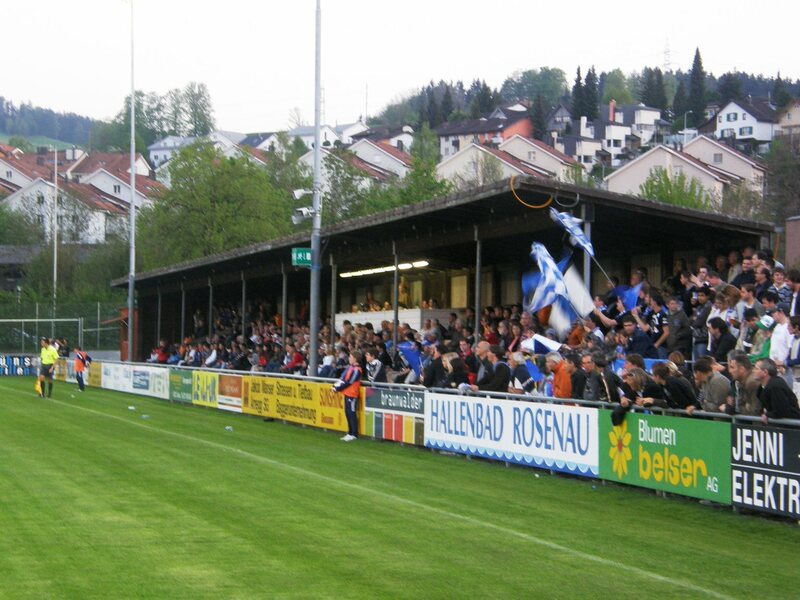 Kärnten FC, who had used the Wörthersee stadion before rebuilding remain at the small Fischl stadion and only just escaped a further drop this season. The visitors at Vöcklabruck for my regionalliga game, Austria Kärnten Amateur, are connected to the top division side. I do not know their provenance before this season, but I can say they put up precious little in resistance to Vöcklbrucks promotion challenge. Two goals in the first half hour showed the home sides determination to please their own crowd. Kärnten then pressed the self destruct button and managed to collect two red cards before the break. Not surprisingly, it was even more easy going in the second half, with a final score of 6-0. Arriving in Brno the next day, it is easy to receive a bad first impression of the place. The area around the station is nothing except a series of seedy fast food restaurants, and 24 hour herna bars. (A herna bar is basically a gambling club, which features mainly electronic fruit machines). However, this is just at street level, you just have to raise your head to see that the buildings above them are on a massive scale. Walk away from the station and into the city, and you come across one of the best examples of late Hapsburg era cities anywhere in Europe. I had been to Brno before, but had little time to see the centre and walked straight out to the cold gray concrete Bobu Centrum, where a football stadium exists next to theatre and cinema in a multi-leisure complex, that unfortunately just looks ugly. In the 19th century, when Brno was the fastest expanding city in the region, due to the industrial revolution, it was known as the Czech Manchester. The Bobu centrum could be called the Czech Arndale. At that time, the club was known as Bobu Brno, but having moved on, they have dropped the name and become 1. 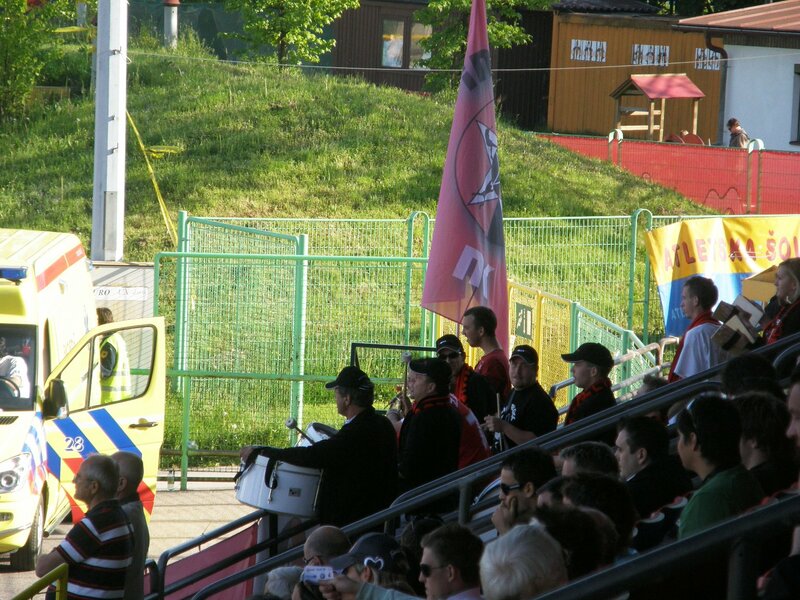 FC Brno. The new ground (more likely it is an older ground, also used before they went to Bobu), is further away from the centre, and I was pleased to find a bus that could deliver me to the door. Three sides of the stadium are a typical bowl with some quite steep steps, and concrete, (unusually for older grounds in Eastern Europe), in good condition. Plastic seats cover most of the areas in use by the public, with only those in the away enclosure forced to sit on bare concrete. There are big fences all around in front of the pitch, with the result, that the front five rows of seats are avoided. The exception is the modern covered west stand, with has only about seven rows of seats, and which is the only covered part of the ground. The front row is at least two metres above pitch level, so viewing is good from all seats, although barriers at the front must mean the back seats are best. Brno need points from the game in their bid to make it to the UEFA Cup. Their bid was boosted by a win at leaders Sparta Prague a week earlier. The team Brno need to overhaul to reach Europe, Banik Ostrava, were co-incidentally away to Sparta at the same time as our game. The away side, Slovan Liberec do not need the points  they have already made it to European competition, regardless of the result of the following weeks Czech cup final, as their opponents, (yes, Sparta again) are certainly in the Champions League, whether they finish the season as champions or runners-up. The home fans had a nice take on this, unveiling a poster to say it was the league, not the cup that mattered  but I wondered if this was just poor sportsmanship, as Brno had fallen in the semi-finals  to Liberec. From Vienna, I take a morning train, and for the next six hours it winds its way south through Austria and into Slovenia, fetching up at the capital Ljubljana six hours later. Convenient train scheduling means that the rest of the party, who had spent the previous evening watching Bad Aussee arrived just thirteen minutes ahead of me. There then follows the routine for a town where we are not staying. Before leaving the station, most of the luggage must go into storage, and a quick check is made on the departing trains for later. On a sunny afternoon, the city is a pleasant place to spend a few hours, although getting six people to a single plan of action would be impossible. Some would like to sit idly in places, to have a drink and watch the world pass them by. Others are determined to be the world passing by, and to see as much of the town as can be possible in the short time available. One member of the party is staying overnight, and disappears quickly in the direction of a cheapish hotel. Some others (which would have included myself, if I had not left the envelope back at home) had old Slovenian money, which could only be changed at a single bank in town. Even though the tourist office said this would be closed, we still stopped to check. As it is, we have only three hours in the city before the start of our game, so after about 90 minutes walking around the city, we are strolling out towards the stadium. The stadium is between two converging railway lines that meet, just at the city end of the ground  the maps say we have to walk well past the stadium and then come back again, but in fact, there are several paths across the tracks, and only motor traffic has to go the long way. The stadium, marked simply as Sportni Park on the map is also known as ZSD or ZSD-ZAD stadium. 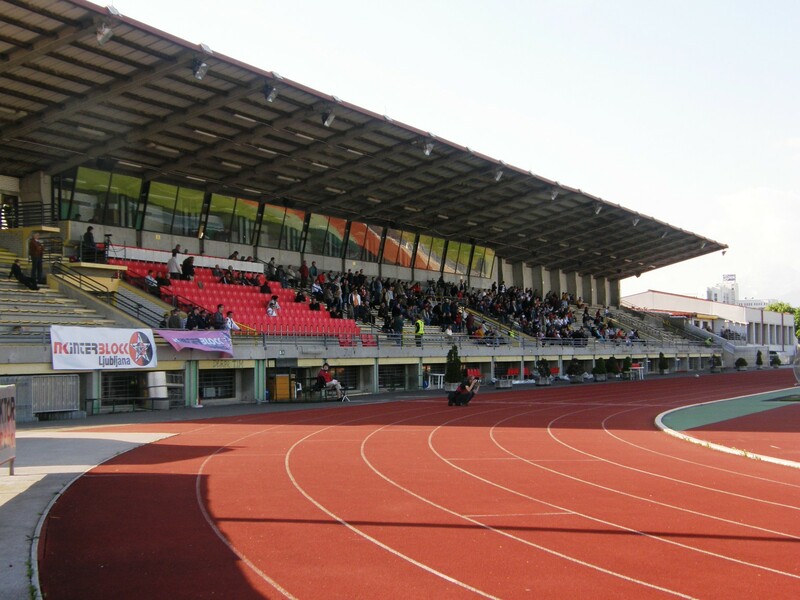 It is a straight forward athletics track with most of the facilities built into the main stand. This is raised well above pitch level, so views are generally good. There are a few rows of uncovered seats on the far side, but with plenty of room for everyone (and then some) in the stand, these are sparsely populated. Around the stadium there are a number of small clubhouses, for different purposes. For example, a tennis club has facilities are the land narrows for the railway, and a small clubhouse. We find one belonging to FC Ljubljana, where we get into conversation with Alois Krapez, the president of the club that actually owns the stadium. Once they would have played at a higher level, but as with many clubs, they have had financial problems, and changed their name from the Slovenian form, where NK means football club, to the English. 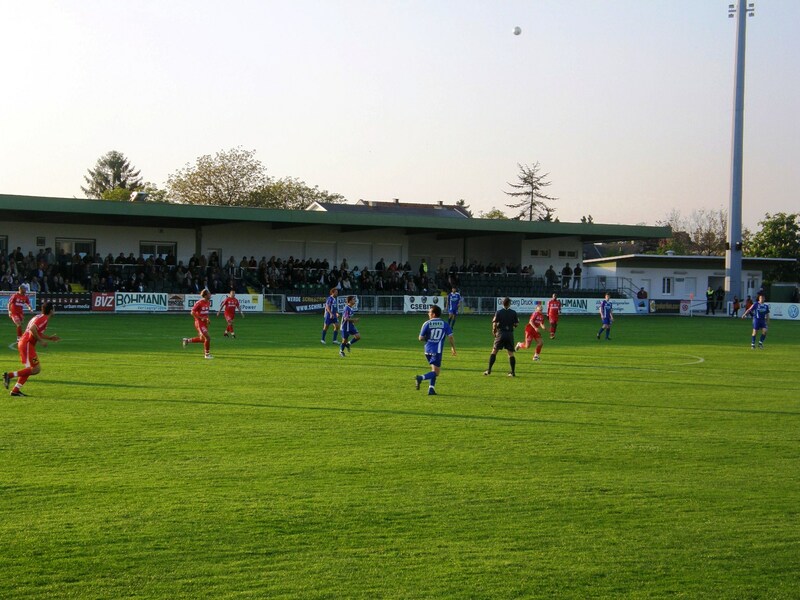 NK Interblock, the home team for the game rents the stadium from FCL, Interblock were formed after the main team in the capital, Olimpja went bankrupt in 2005 (and the clubs other team, the one now known as FC Ljubljana were relegated for financial reason). The owner of the Interblock company, Jose Pecenik, known as the king of roulette choose to keep football running in the capital. He bought out Factor (which is also a sponsors name) which was then a second division club and has seen them through to a stage where they are challenging for a place in European competition. According to our hosts from FCL, only 4% of the budget for Slovenian league football comes from TV contracts and sponsorship, while at most clubs only 2% would come from gate receipts. The portion from gate receipts is even less at Interblock, as tickets are in fact free. This means the vast majority of a clubs expenditure is directly funded by the owner. With an annual budget of 2 million, Interblock is reputed to have the highest budget in the league. For comparison, this is similar to the turnover of a club such as Cheltenham Town, whose budget is reputed to be the lowest in League-1. Meeting and talking to officials of small clubs is always a highlight of any tour, as it gives a valuable insight into the operation of football. The conversation was helped on its way be a local Slovenian dark beer, which was referred to as Slovenian Guinness. This was clearly a stout, and had a strong and pleasant taste but was less heavy than the Irish original. We said out goodbyes and entered the stand to watch the game. Around the ground, the wire fencing is covered by a series of shirts showing the current Interblock squad, plus the name of the team and there well known red and black pentagram badge. There are about four wire panels without a cover, and it appeared that each one had a single spectator behind it, gaining a free view. This seemed strange to us  who needs to gain a free view, when tickets are in fact, free? The badge, with its similarity to an occult symbol has led to the clubs rivals referring to them as The devils club. With the exception of Hutch, who was staying, we had just over 90 minutes after the match, before our train left. For once the group is unanimous  food was the order of the day. Sometimes finding the correct time to eat can be a problem on these trips  for example in France, where most matches kick off around 8 p.m., the period 8-10 in the evening are the central business hours for restaurants, and in smaller towns, there is a limit to what you can get earlier or later. A kick off at five oclock, may not be the best for the crowds to reach after working, but does mean all the restaurants are open at the games end. Then onto the train  five of us in a six couchette compartment for a near twelve hour journey. The conductor took one look at us, and decided to move the other occupant, an elderly woman, to the empty compartment next door. Preparations (only one person can make up the bed at a time in the narrow compartment) take a while, and the area starts to smell of sweaty mens socks. It takes a while after the train gets away for the air conditioning to bring some comfort to proceedings, but eventually some sleep is to be had. Generally, I do best, as I am the only one who is not to be woken by my snoring  but I still never sleep well in transit, and I have a tendency to wake each time the train stops for a while. We end up in Zurich, where we find some small breakfast, (for some large price, we are in Switzerland now) and then break the group into two. The Wolves fans are heading south to Locarno, whereas the rest of us take the short journey east to St. Gallen. This is a relatively small town, but with a very attractive old centre. 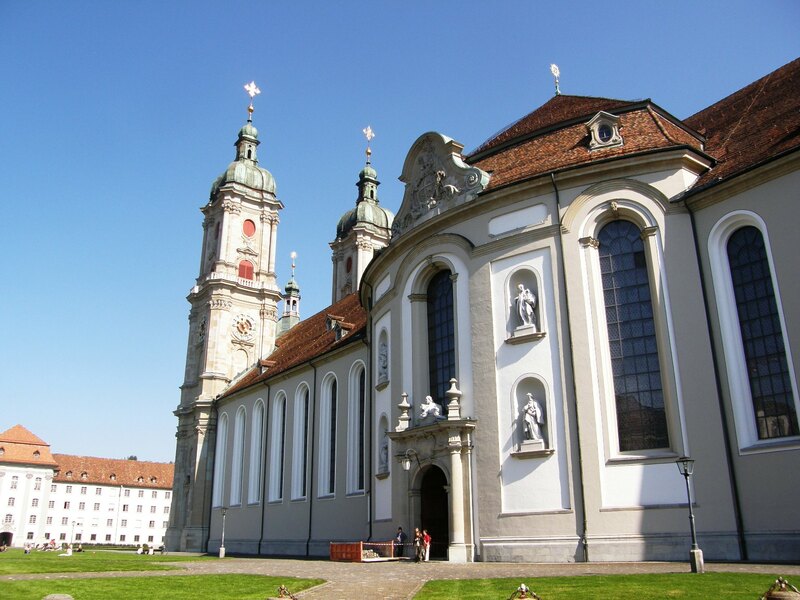 The baroque cathedral dates back to the 18th century, and is impressive both inside and out  although it did appear that one of its best features was the lawn outside, as the city was otherwise devoid of green space in its centre. Around the cathedral, many half timbered houses date back to the same period, when the town was wealthy from the textile trade. St. Gallens Football Club won the Swiss League in 2000, but this was very much a one-off, with the bigger city clubs having returned to the fore since. A new stadium well out away from the town is to be opened this summer, but the club risks playing in front of tiny crowds in the second division (known in Switzerland as the Challenge League, the top division being the Super League). 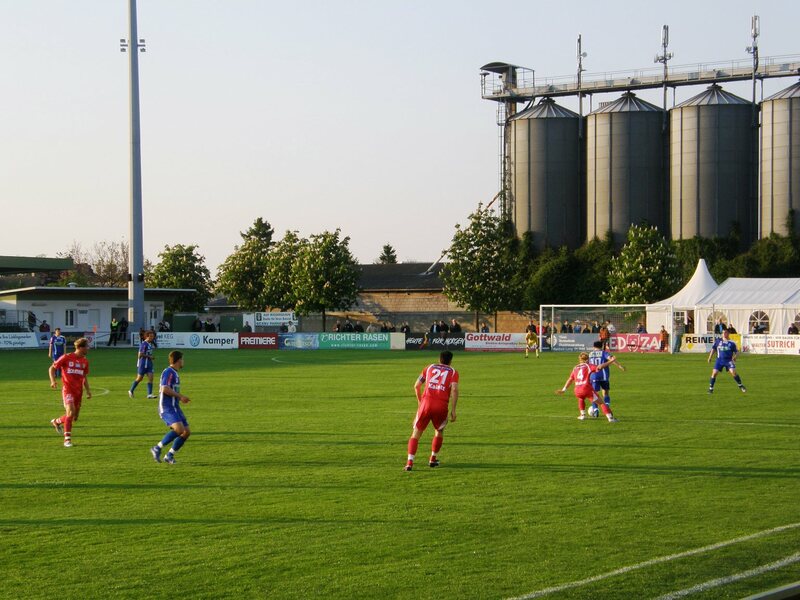 It was a neighbouring Challenge league team we had come to see  Gossau is eight minutes down the line from St. Gallen. We took a twenty minute walk around the town and confirmed that as far as seeing the sights are concerned, this is twenty minutes too long. The football ground is also easy to find. Exit the station at the southern side, and cross the road, (its not a big road). The majority of one side has been built up with about half a dozen wooden steps  about three quarters of the stepped area is covered by the simplest of wood and corrugated steel covers (with support pillars in the front), while the seating area takes up about half the zone. There are also a few steps of terracing without cover on the opposite side, and another similar area, this time fenced in behind the goal furthest from the railway  this being the away enclosure. 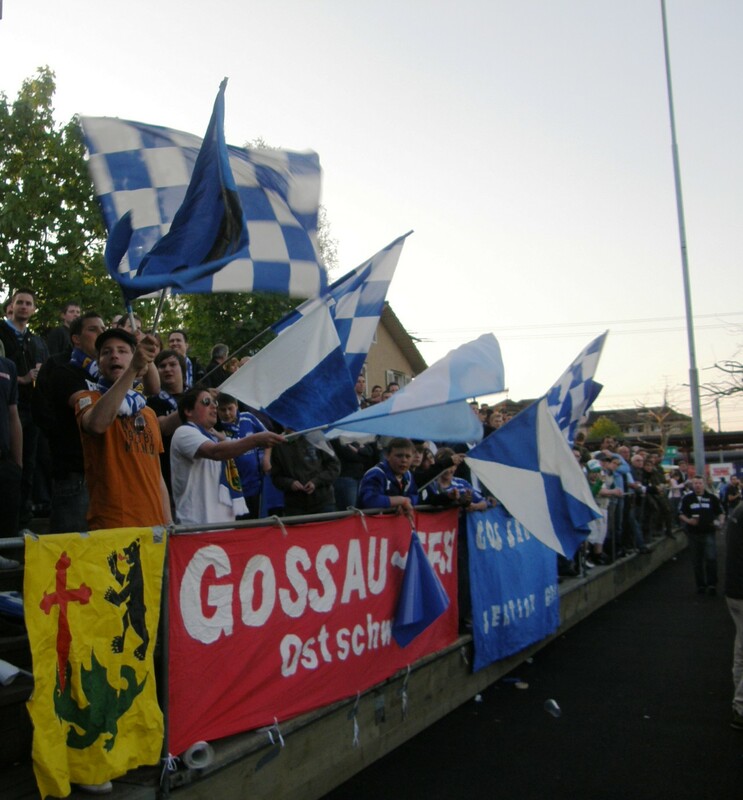 The visitors, Lausanne-Sport brought about 30 fans with them, while the total crowd was given in the following days papers as 800. (There is some doubt among my compatriots about the counting which meat this healthy looking crowd was apparently only 100 more than the sparse one at Interblock. Interblock may have their reasons for reporting a relatively high crowd, and as tickets are free, they do not need to tie crowd figures to gate receipts. Gossau benefit from the fact that small crowds look better in compact stadia, and I think their 800 may be correct. As for the game, it never got into second gear. Despite league positions that mean both teams are fairly certain to stay in the Challenge League next season, (either side would guarantee their place with a win), they both played a defensive game showing more fear of losing than hope to win. It was not until after the break that we really saw some effort from the two teams to win the game. Lausanne took the lead with a long shot that took everyone by surprise, while the home teams equaliser, seven minutes later was from the penalty spot  and that too took us by surprise. So after three matches in different countries, the tour has yet to take off in footballing terms. It seems that defensive formations and tactics are ruling the roost. The next match will see me alone again in Austria  but will the football pick up? There are a number of factors that make May an ideal time of year for groundhoppers to set out on European tours. First and foremost among these is the fact that most football in England has come to a halt within a week of the start of the month, while European Leagues continue late into the month. These leagues, often regimented to weekend football through most of the season, take advantage of the late spring sunshine to add midweek fixture lists. I was first introduced to the idea some twenty years ago, and have managed at least ten tours in that time. Some of the others, despite already having done a few trips before I started have barely missed a year since, (although in the case of home and away club fans, they make far fewer long weekend trips during the season). The law of diminishing returns applies, as we are not looking to return to football grounds we have visited before  so most of the major clubs in most major European capitals have already been done. It used to be that trips would always start and finish in Germany, and this would be the spine of Europe, thanks to its fast connections. I now look at the trip in a different light, and have decided to concentrate my efforts on the South-East of Europe, with much of the tour being to countries bordering Austria. The idea of a tour is not the same as a weekend trip. On the weekend, a relatively small number of people go to the same places, and generally the same matches. On tour, you choose your own matches, but in the knowledge that others are making similar tours, and that you will meet up with them on different days. Sometimes I have met over a dozen English hoppers (and maybe a couple of Germans as well) in a two week period. This time, I have co-ordinated with five others in advance, although this does not mean they will be the only ones I meet. The cast for the trip is as follows, Paul and Kevin, are full timers, and like myself are spending three weeks abroad. Hutch, who is only here for the first week, plus Pete and Stan, two Wolves supporters who arranged to do two separate trips, in the hope that their club would be in the play-offs in between. Pressures at work keep the trips unchanged, even though there are no Wolves games back in England. We all started on the 6.30 flight from Stansted to Salzburg, care of Ryanair, but immediately, different philosophies and needs came to the fore. I alone took the 11.00 train to Vienna to see Parndorf, whereas the others had a later connection and were going to Bad Aussee. Why do I shun this match, (its not somewhere Ive been). Because I am still trying to get to the stage where I have been to all teams in the top two divisions of the Austrian League, and it is almost a waste to go to a team already consigned to relegation back to the Regional leagues. The others see this as their last chance to see Bad Aussee as a league side, plus they are hoping the need of Kapfenberg to pick up a single point (in this, or two remaining games) to be certain of the championship and promotion should make for a better game. At Parndorf, I am watching a team that still has a chance of avoiding relegation, although the current Austrian set up makes for a lot of change in the professional line ups. The Bundesliga has ten teams, and exchanges one a season with the Eerste Division of 12 clubs (two of which are reserves of Bundesliga clubs). The bottom three of the Eerste division get relegated, with the Champions of three Regional leagues promoted in their place. Parndorf are 10th of 12, and need points if they are to avoid the drop. 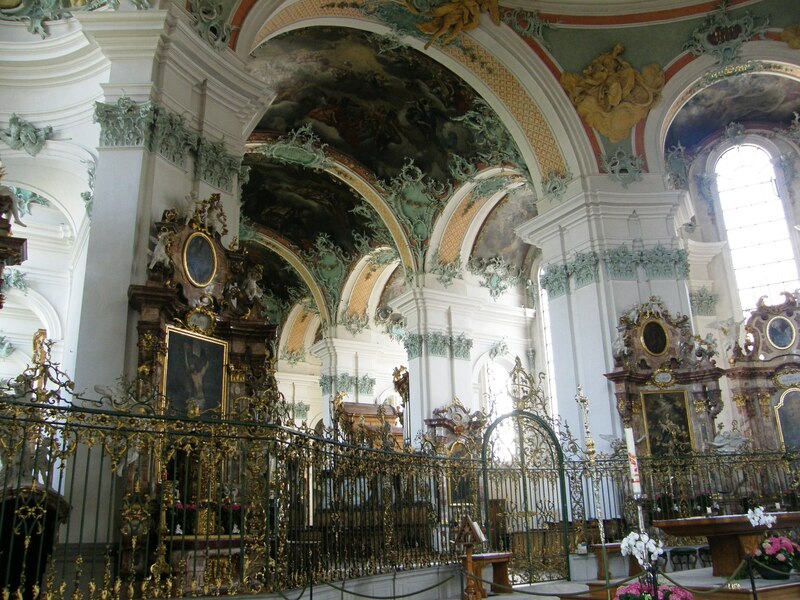 The town is not far south of Vienna, and is closer still to the Slovakian capital, Bratislava. There are two stations, and I choose the one that appeared to be closest to the ground  maybe not a good decision as the area was deserted when I arrived, the other station is nearer to any activity the town has to offer. It was not a difficult walk to find the stadium, although just too far for me to make the early train back, leaving me waiting almost an hour on the deserted station. The only other people there were a van full of police sitting just outside, looking for the hordes of trouble makers from the visiting team. The fact that these hordes did not appear before the game, and were absent throughout the match, does not mean they should not be policed afterwards! It is clearly this strong policing that keeps the lower division free from trouble, (well, it couldnt be down to the fact crowds rarely raise much above 1000, and only a handful of fans travel away). The Heidebodenstadion is a low lying structure. Its main side consists of covered seats the whole length of the pitch, but only six rows of seats. There is a walkway at the back, giving access to various refreshment points, I had a cooked meat in a bap, a change from the standard burger. The opposite side, the buildings are lower, with the spectator accommodation uncovered. To one end was four rows of seats, at the other end, a few steps of concrete terracing  in the middle, an open area with tables at the height for standing around. There are no restriction on alcohol sales, except the only beer on offer being a quite tasteless frothy lager. The areas behind both goals were generally flat and unused by spectators. At one end was a large marquee for VIP and business guests to eat and drink, whereas the other end had a small area built up as a terrace and then fenced off. With the away hordes staying away, this remained empty. The true advantage of this low level ground, is it that an attendance as small as 900 takes up over half the seats on the main side, and makes the ground seem fairly busy. The game started slowly, and rather scrappily, with the referee rather too willing to give a free kick and bring on the trainers. I think the turning point may have been when the ref got fed up with this. A visiting player had gone down, his appeals for a free kick were ignored. He stayed down, and even refused the referees hand to pull him up after the play had stopped. The ref continued to refuse to allow a trainer on, the player eventually limped to his feet, pointed to his ankle, and was finally shown the yellow card. Not surprisingly, this did have a curative effect. The visitors were Schwanenstadt, but sadly the need for sponsorship mean they now go under the name of SCS Bet-at-Home.com. No wonder the fans stay away, one cannot chant Bet at home, bet at home, so perhaps it is better to stay home, check the score by internet, and actually, Bet-at-Home on the final result. Starting in a defensive 5-4-1 formation, the home team were clearly concerned not to concede early, and this did restrict the chances on offer. It did mean it required a free kick or corner to get sufficient numbers upfield to create a real threat. It was indeed a free kick that allowed them to take the lead on 29 minutes, the ball being half cleared and then kicked back into the area, where centre half Matthias Novak stabbed it home. Schwanenstadt levelled just before half time when the home defence relaxed its grip for a moment. Early in the second half, Parndorf were confident enough to make a change and move to a more attacking 4-4-2, although it was more the opposition that then gifted to points. On 63 minutes, a silly foul allowed Marcelo to regain their lead from the spot, and five minutes later, Schwanenstadt had centre half Ratajczyk sent off for his second booking. A substitution meant they changed to 4-4-1 formation, but failed to threaten the goal again. Parndorf created a few chances, but had to wait until injury time when a parried save left the opportunity for substitute Hörtnagel to increase the score. Meanwhile at Bad Aussee, the score was 1-1. Kapfenberg are therefore champions, (other results meant they would have been even if they had lost). You are currently browsing the Football Shaped blog archives for May, 2008.